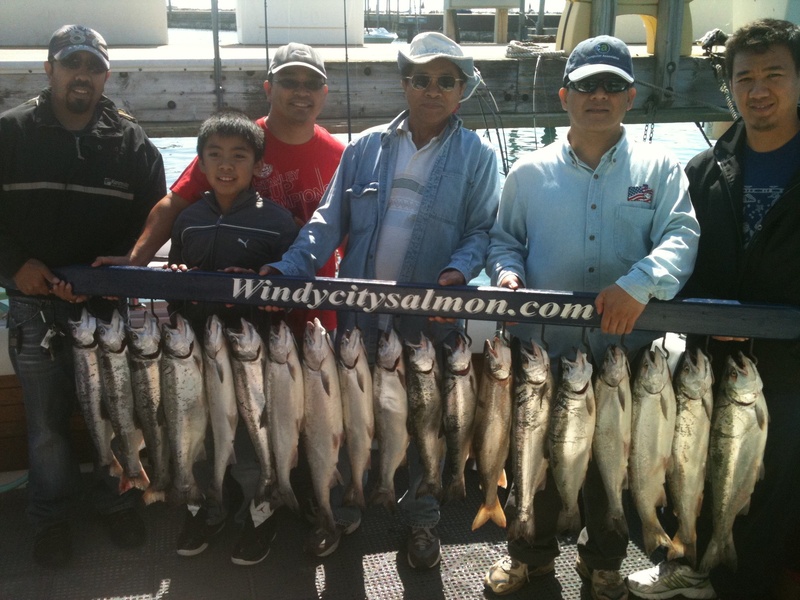 Hello and welcome to the Windycitysalmon Online Store where you can purchase a variety of different coho salmon and steelhead trolling flies. I hand-tie all of the coho flies you see pictured below and primarily employ these exact flies you see here when taking clients out fishing for coho salmon and steelhead during the spring months. Under most circumstances, an 18-inch leader (40 or 50# monofilament) from the tip of the loop to the back of the hook will perform the best when run behind 6″ or similar size (red/orange or firedot) dodgers or flashers. I prefer 6″ Jensen dodgers however the same size Alderton Action flashers work very well when teamed-up with select patterns. All coho flies are tied on #4 Gamakatsu and VMC hooks. 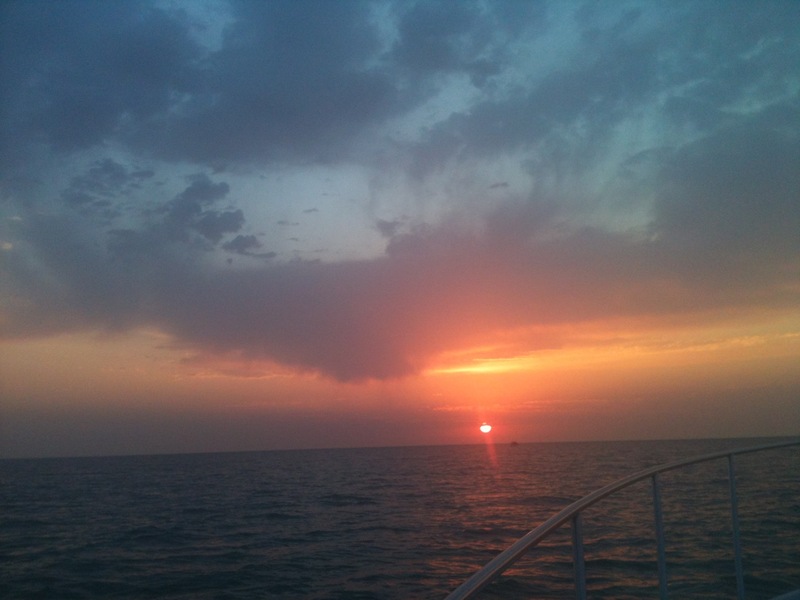 The southwest corner of Lake Michigan where Waukegan is located, is the most productive area of Lake Michigan each spring-season for coho salmon. 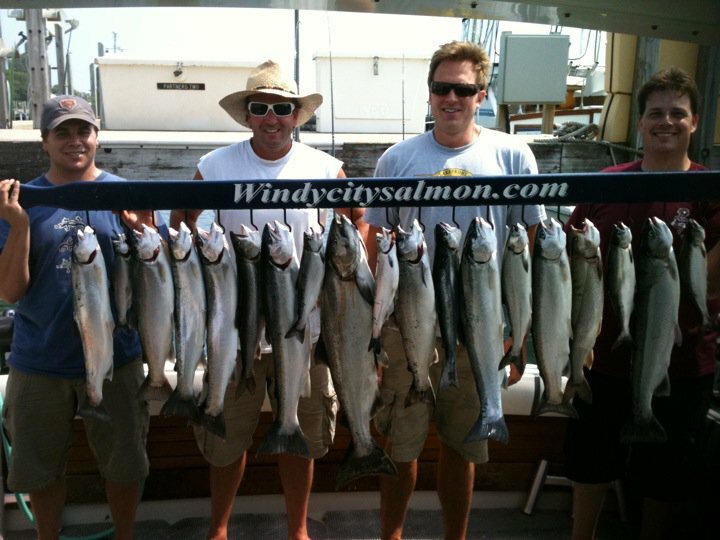 This legendary coho fishery yields huge hauls of fish for our charter clients as well as private sport fisherman, for weeks and sometimes months at a time. 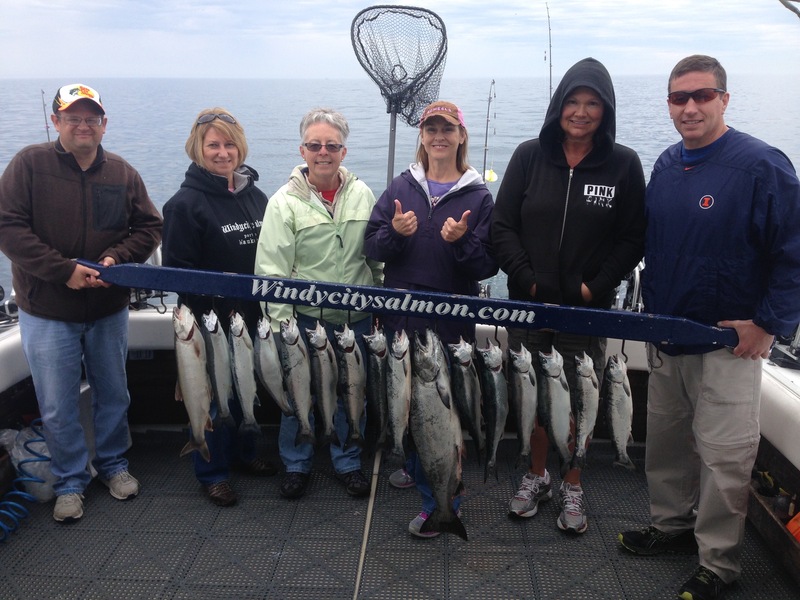 Charter operations from all over the lake descend on Waukegan waters each spring to capitalize on the schools of coho that mass-up and go on spring-long feeding frenzies. Trust a captain and fisherman that knows coho, grew up with and now makes his living, fishing for coho salmon with these same flies. If you have any questions about the flies, feel free to call or email me. Good luck and good fishing. All coho flies are $3.25 each. You can increase quantities at checkout. I am proud to offer FREE SHIPPING on all fly orders, eight flies minimum. Orders of seven or less flies will carry a flat $3 shipping fee. Junebug Coho Flies – New for the 2012 season, these coho flies were a TOP producer and often occupied half or more of my standard 16 rod spring-spread. Usually works best when fishing a little further offshore over the second half of the coho season. I expect it to remain a solid pattern among all of my trolling flies for many seasons to come. Lime Ricky Coho Flies – New for the 2011 season, these unique trolling flies shined that year and has done well ever since. It seems to do particularly well in stained, shallow water which we often experience in the spring after high wind/waves stir up shoreline sediment. But don’t overlook it for offshore either. Blue Liz Coho Flies – One of the best patterns ever tied for coho flies. I shrunk it down, put it on a red hook and this still is often among my best trolling flies. This fly seems to work well under any light condition in clearer, unstained and further offshore waters during the second half od coho season. Aqua Mirage Coho Flies – A top producing trolling fly every season. Sometimes called the ‘improved’ or ‘revised’ or teal and mirage, this fly becomes a go-to pattern and works under a variety of light conditions and water clarity. This fly now comes tied on a permasteel (silver) hook as the green versions became difficult to find. This coho fly will work very well at times when run behind a 6″ Jensen Firedot (yellow and red dot) dodger or the Adlerton Action flasher. Two-tone, lime-aqua Coho Flies – This is a legacy, stand-bye pattern among our spring coho flies, known as ‘two-tone’ in Waukegan. It continues to perform well every season. But especially early in the season and in shallow, stirred-up water. But has also been a recent star when run down deep (60-90′) for offshore schools of coho, in recent seasons. This fly now comes tied on a permasteel (silver) hook as the green versions became difficult to find. RBS Coho Flies – Red, black and silver on a red hook. These trolling flies often do well on days when the coho are finicky and aren’t hitting other patterns. I will often run at least one in my spread just to see if the fish move into that mood and don’t like anything else that’s out there. Bleu Cheese – One of the best trolling flies you can run for steelhead up on the surface. Dark blue and copper. There is something about the color copper that the steelhead can see well. This is a trolling fly that does well with steelhead if they are around and they catch coho too. I prefer to run this fly when fishing further offshore, in clearer water, on an outside planer board. Purple Liz – Purple Liz Coho Flies – Similar to the blue liz but with purple flashabou instead. Like the RBS, coho seem to prefer these trolling flies a little more when they are finicky with other colors. I do particularly well on this fly when running it in clearer, offshore water, on my inside dipsies, closest to the boat, 12-25 feet out, during the second half of the coho season. Rainbow Rising Coho Flies – New for the 2013 season, these multi-colored trolling flies are tied on red hooks and resembles an old pattern I used to fish when I was a kid called the Christmas Tree. I added a segment of mirage in there too for additional flash. Kringle Coho Flies – New for the 2013 season, these multi-colored trolling flies are a very unique pattern and had their moments during their first and subsequent seasons. Rainier Coho Flies – New for the 2013 season, I tied these coho flies when we discovered that our coho were feeding heavily on what looked like common house flies. I was very excited to run it in 2013 and it did not disappoint. Oasis Coho Flies – New for the 2013 season, these straight mirage and powder blue-aqua trolling flies are a big up-and-comer and are sometimes my best fly when fishing under a bright sun. I used to tie them on red hook but found that a permasteel (silver) hook makes them more effective. This fly seems to to do well in both clear or stained water. However, the fish seem to like it the most when further offshore in clearer water. Try running it behind the Jensen 6′ Firedot (yellow and red dot) dodger. Classic Black/Blue/Purple Coho Flies – A classic, three-tone standbye trolling fly pattern. The dark blue segment in these flies is facing down in this photo. It is one of those patterns that works well under any light condition and is often a pattern that you load up your spread with when the coho indicate their preference. I no longer tie it on a red hook but rather a black hook as the all-dark colors of this pattern seem to work best. Moth Coho Flies – I tied and ran these trolling flies in 2012 when we learned that coho were eating lots of white moths. Adding a hint of pearl also, this fly still has its days.